Just the other day I was driving down Farrington Rd to check out the new Montclair Chapel Hill Neighborhood. I noticed small signs on the side of the road that said “No C2” and “No C2A”. I had no idea what this meant. Is it a carbon dioxide going into the air in Chapel Hill? 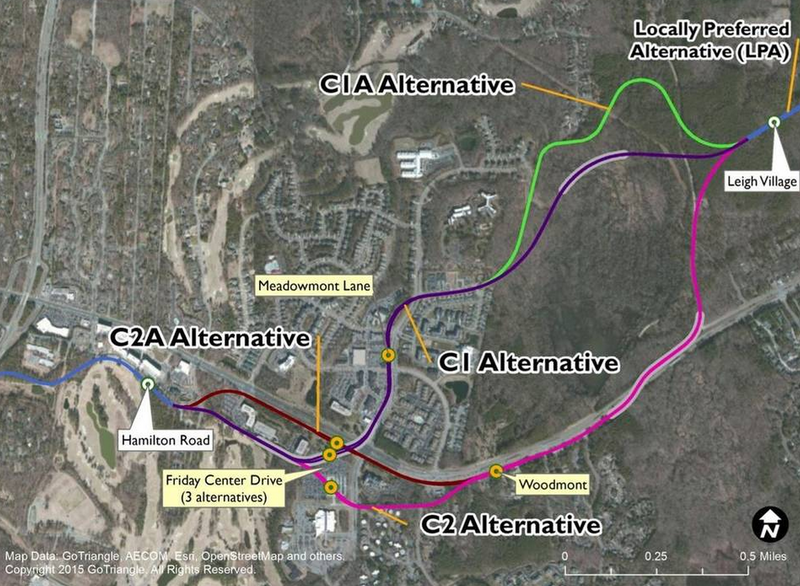 After a little research and some information sent to me by Jodi Bakst I found out that C2 and C2A are the alternative routes for the Durham-Orange light rail train that will connect Durham to Chapel Hill. Jun. 2, 4-7 p.m., Chapel Hill Public Library, 100 Library Drive. Jun. 4, 4-7 p.m.: Durham Station, 5151 W. Pettigrew St.
Jun. 6, 4-7: John Avery Boys and Girls Club, 808 E. Pettigrew St. If you have an opinion about this particular proposed route please feel free to comment below. I would love to hear your opinion.